my first encounter with this brand was years ago, probably in highschool (now don't dare ask me how long that was! 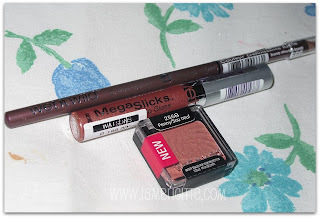 ), when a relative from the US went home and gave me tubes of lipsticks, blushes and some eyeshadows as pasalubong. i was only 14 y/o at that time, and back in those days, it's not so often to see a teenager wearing makeup unless there's an event or something. i sniffed the products and found the scent to be too strong so I gave them away to my aunts and older friends. fast forward 10 years, i was already starting out to apply makeup and i often get disappointed from trying out some cheaper brands, hoping to save my hard-earned moolah (yep, i was already working when i started applying makeup...probably i've been working for 2-3yrs when i started). from then on, I try to stay away from "cheap-priced" products thinking that their quality will just make me end up getting frustrated, and my money wasted. i've watched some YT videos of some makeup gurus raving on Wet n Wild and hoped that the product will soon be available here. I got these items for less than Php200 each. I haven't played with the rest of the stuff but I must say that their eyeshadows are great! i love the pigmentation and the staying power..oh yes, no smudging/creasing even without a primer! how about you? have you tried any of their products? did you love it or not? please let me know, I want to get more of their must-buys! hi thanks for visiting my blog. im a big reader of your blog. 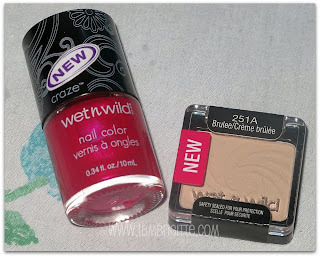 may i know where did you buy Wet n wild? would like to try them.